Very well designed body with excellent ergonomics and well thought out button placement in a smaller and lighter package compared to most traditional dSLR models with optical viewfinders. High resolution 3" LCD with tilt and rotate. Bright 0.46" EVF (Electronic Viewfinder), providing 100% frame coverage with 1.10x Magnification, making it a pleasure to use compared to the smaller optical viewfinders that are typical on traditional dSLR models in this price range. Faster frames than you'd expect to find in models in this price range, combined with innovative features like Sweep Panorama, Multi Frame Noise Reduction and hand held Auto HDR. Ability to use any Minolta or Sony A Mount Autofocus lens, while taking advantage of Sony's sensor based SSS (Super Steady Shot) stabilization system to reduce blur from camera shake. The EVF doesn't offer a full range of bright to dark in all conditions, as its dynamic range is limited in harsher lighting (but we were still very pleased with it's usability). When using the fastest 6 to 7fps drive mode settings, Sony gives you a sequence of still images in the EVF versus the fluid live view you get using Low Speed drive mode at 3fps, making it more difficult to follow action using an EVF in some conditions. Although battery life was better than expected given it's CIPA ratings, it's still lower than most dSLR models with more traditional designs using an optical viewfinder. Sony has taken a bold step in launching a new breed of interchangeable lens digital camera via their Single Lens Translucent (SLT) design that offers some unique abilities like giving you Live View with fast Phase Detect Autofocus for both stills and video. We were impressed with the A33's usability, image quality and performance oriented features during our testing, especially when you consider it's attractive price point, and we have little doubt that this camera will appeal to a wide variety of photographers. Read more in our Full Conclusion. 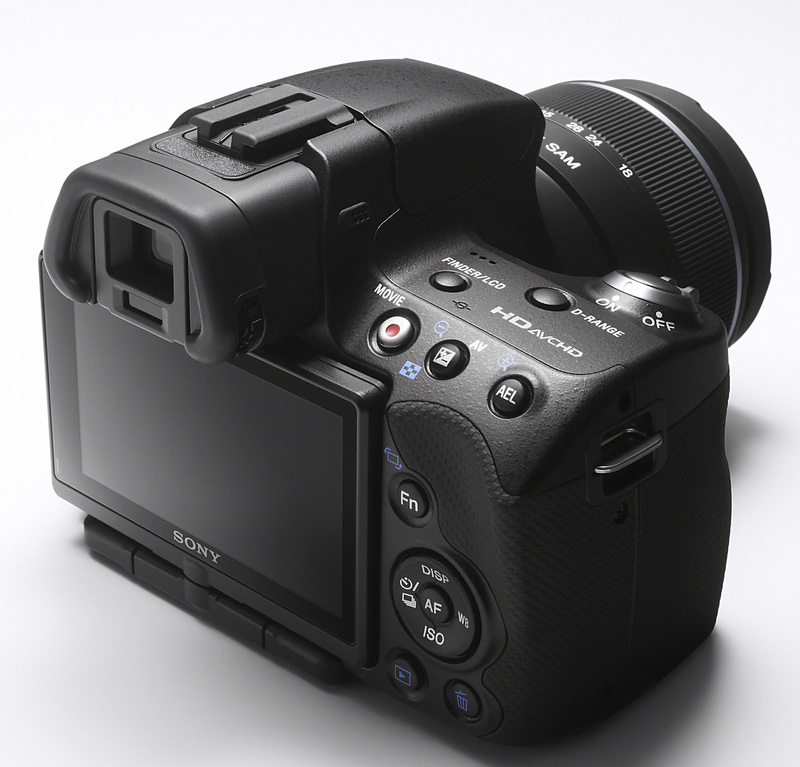 Sony has announced a new technology built into two new alpha series cameras for 2010, the α33 (SLT-A33) and α55 (SLT-A55V). Translucent Mirror Technology is built into the two models and basically raises continuous shooting and focusing speed compared to the design used by your typical dSLR camera. While the α33 allows for up to 7 frames per second, the α55 can take photos at up to 10fps. In addition to the TFT inclusion, Sony has equipped these new Alpha models with a 15-point autofocus system that allows for more accurate tracking of moving objects. Other features include 14.2-megapixels, 1080i HD video recording, full time live view, a rotating 3.0-inch LCD screen, and sweep panorama mode (3D mode included). 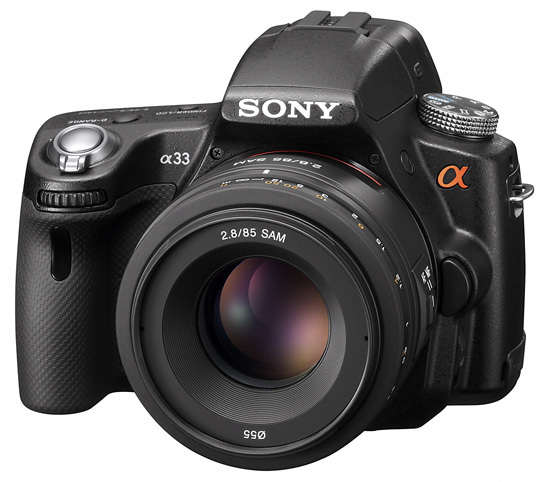 The Sony SLT-α33 is available now for around $699.95 US for the camera body and 18-55mm lens kit. Purchasing the body alone will cost you around $599.95 US.